University of Houston-Victoria men’s soccer team members assist victims with Hurricane Harvey recovery. The team was awarded the NAIA Buffalo Funds Five-Star Champions of Character Team Award on Thursday. The University of Houston-Victoria men’s soccer team was awarded the NAIA Buffalo Funds Five-Star Champions of Character Team Award on Thursday. The men’s soccer team is the second UHV sports team to earn the Champions of Character team award. The UHV baseball team was recognized last spring with the Hank Burbridge NAIA Champions of Character Team Award for baseball. The UHV soccer team is heavily involved in the Victoria community sponsoring numerous camps, blood drives and other community activities. This past season the major service project for the Jaguars was working with the community following Hurricane Harvey. Several members of the team that evacuated to the Houston area as the storm approached quickly jumped into action and came to the aid of the victims from the storm that caused massive flooding in that area. The student-athletes volunteered for two days at the Interfaith of the Woodlands Community Disaster Relief Distribution Center in Conroe. There, the student-athletes assisted in unloading supplies from large trailers, sorting pallets of supplies, and distributing to those in need in the affected area. Upon their return to Victoria, the Jaguars wasted little time in volunteering with the Samaritan’s Purse International Relief Program to bring help to Victorians trying to clean up from the aftermath of the Category 4 storm. 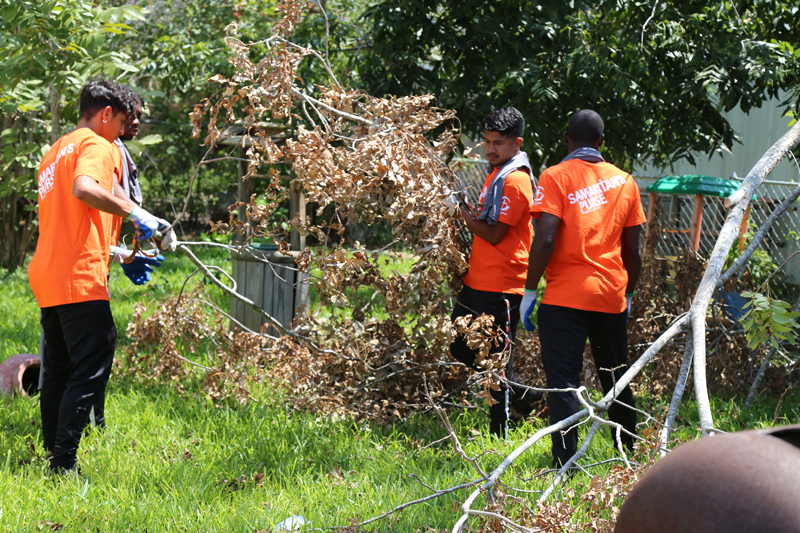 The group spent time trimming fallen trees and moving tree limbs, as well as helping families whose homes were flooded by the Guadalupe River during the storm. This included tearing out damaged drywall, removing flooring, tarping roofs and clearing debris. The storm also was a setback for the team as they were unable to practice for two-plus weeks and had its first four games of the season cancelled due to the damage done by the storm that also delayed the start of fall classes. Senior midfielder Brian Foulger said the delay helped bring out the character of the team that eventually went on to finish the year 11-3-2 and earn its first-ever trip to the NAIA National Championship Opening Round. The Jaguars also took part in the annual Movember Movement in November for the seventh straight year to help raise funds for cancer research and help sponsor a blood drive. UHV’s Isaac Ramirez-Garcia was also honored at the NAIA Opening Round with the team’s individual Champions of Character Individual Student Award.